Are dog parks safe? Tips for safety at the dog park. I don’t like dog parks. 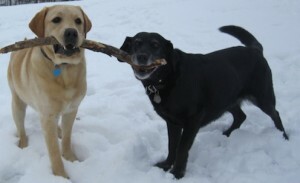 I don’t mean big open green spaces – Kali and I explore these on a daily basis.That’s her in the picture at one such park, sharing a stick and a goofy grin with her handsome friend Buffett. I’m referring to the fenced-in-designated-off-leash-zones or ‘corrals’ that are popular in this city and many others. In theory they might sound great – a meeting place for dogs to all frolic together – but the reality isn’t always so idyllic. Off leash corrals can be a mixed bag of dogs who are too untrained and unmannerly to be trusted off leash anywhere else and dogs who may be well trained but are completely unsupervised while their owners sip coffees and exchange chit chat at the other end of the park. On weekdays the dogwalkers take over and it’s not uncommon to see 40 or more dogs barely supervised by just a handful of people (I know there are some knowledgeable and responsible walkers out there, just not enough; but I’ll leave that for another article). I’ve seen dogs being ganged up on, bullied and overwhelmed while owners do nothing, either because they aren’t paying attention or due to pressure from other park patrons (beware the self professed dog experts that are at every park). Not only are dogs getting hurt and worse at these dog parks, humans are too. I’m admittedly biased. As many of you know 2 years ago Kali was attacked and seriously injured in a popular mid-town corral. Not one person stepped in to help me pry the other dog’s jaws – a full size, large breed young male – off her neck and the owner of that dog refused to help with the cost of the emergency surgery she required. We were both traumatized although Kali, to her credit, recovered long before I did. That could understandably turn someone off dog parks but the truth is I wasn’t much of a fan long before that day (was only there after begin threatened with a ticket earlier that week). Partly because I would rather walk than just stand around but mostly because of all the problems I saw. Does that mean all dog parks are bad and that you should never go? Of course not. I still go once in a while with clients and their dogs and have always been able to ensure a good time is had by all without anyone getting hurt (other than me from having to bite my tongue a lot!) Armed with some dog park savvy, you can too. Does the park feel open and spacious or crowded with dogs? Crowding often lead to stress and aggression. Are owners attentive to their dogs AND interacting with them or are they all in a huddle at the other end of the park? If you can’t tell which dogs belong to whom, the owners are probably not as engaged as they need to be. Are there lots of areas for humans to sit and relax? To paraphrase respected trainer, shelter director and author Sue Sternberg: where there are people sitting, there are peole not paying attention to their dogs. Ditto for owners on their cell phones. Dogs should not be allowed to swarm the entrance zone every time a new dog arrives. Familiarize yourself with how dogs express stress as these are generally good predictors of aggression. Dr. Sophia Yin’s Body Language of Fear in Dogs is available to download for free or you can email me and I will send it to you. For lots more great info on having fun and staying safe, check out the APDT’s Guide to Dog Parks. Get informed. Then go and have fun!